josedesanmartin is a Legacy Library. Legacy libraries are the personal libraries of famous readers, entered by LibraryThing members from the Legacy Libraries group. » José Francisco de San Martín Gómez y Matorras's catalog. » José Francisco de San Martín Gómez y Matorras's legacy profile. josedesanmartin is also an author. About meJosé Francisco de San Martín, also known as José de San Martín (c. 1778 – 17 August 1850), was an Argentine general and the prime leader of the southern part of South America's successful struggle for independence from Spain. Born in Yapeyú, Corrientes in Argentina, he left his mother country at the early age of seven and studied in an aristocratic school in Madrid, Spain, where he met and befriended Chilean Bernardo O'Higgins. In 1808, after joining Spanish forces in the Peninsular War against the French, and after participating in several battles such as the Battle of Bailén, San Martín started making contact with South American supporters of independence from Spain. In 1812, he set sail for Buenos Aires from England, and offered his services to the United Provinces of South America (present-day Argentina). After the Battle of San Lorenzo of 1813, and some time on command of the Army of the North during 1814, he started to put into action his plan to defeat the Spanish forces that menaced the United Provinces from Upper Perú, making use of an alternative path to the Viceroyalty of Perú. This objective first involved the creation of a new army, the Army of the Andes, in the Province of Cuyo, Argentina. From there, he led the Crossing of the Andes to Chile, and prevailed over the Spanish forces at the Battle of Chacabuco and the Battle of Maipú (1818), thus liberating Chile from Royalist rule. Then he set sail to attack the Spanish stronghold of Lima, Perú, by sea. On 12 July 1821, after seizing partial control of Lima, San Martín was appointed Protector of Perú, and Peruvian independence was officially declared on 28 July 1821. A year later, after a closed-door meeting with fellow libertador Simón Bolívar at Guayaquil, Ecuador, on 22 July 1822, Bolívar took over the task of fully liberating Peru. 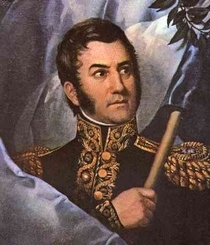 San Martín unexpectedly left the country and resigned the command of his army, excluding himself from politics and the military, and moved to France in 1824. The details of the 22 July meeting would be a subject of debate by later historians. Together with Simón Bolívar, San Martín is regarded as one of the Liberators of Spanish South America. He is the national hero of Argentina. The Order of the Liberator General San Martin (Spanish: Orden del Libertador San Martín) in his honor is the highest decoration in Argentina. About my libraryBrought from Cádiz, Spain, to Buenos Aires, Argentina. Later to the cities of Mendoza and Santiago; and finally to Lima, Perú, as a gift to the citizens of that city when he became the protector of that country and founder of the Biblioteca Nacional del Perú. The entries in this library derive from José Pacifico Otero´s "Historia del Libertador Don José de San Martin", Ed. Sopena Argentina, Buenos Aires, 1949. (Documento F, "Catálogo de la biblioteca que poseía San Martin y que regaló a la ciudad de Lima.- Archivo de San Martin. Museo Mitre. Caja Nº 71.) Even though is not a "catalogue" but an inventory of the books in his possesion, it is possible the reconstruction of the actual library. After San Martin´s death in exile (Boulogne-sur-mer, France, 1850) his son in law, Mariano Balcarce, donated the remaining books of his library to the Biblioteca Nacional of Buenos Aires, where they are kept today in the treasury.